These imaginative sweaters were knitted by Australia's oldest man who is 109 years old. Don't you love them? And him? He's been knitting since he was 30! Read story here. How long does it take to master a craft? How about 80 years? Because 109-year-old Australian Alfred Date has been knitting since the 1930s and his latest/most famous endeavor was making mini sweaters… for endangered penguins! Back in 2013, Victoria’s Phillip Island Penguin Foundation asked for volunteers to make sweaters for the rare “little penguins.” Alfie, who has yet to learn to say no, pitched in. 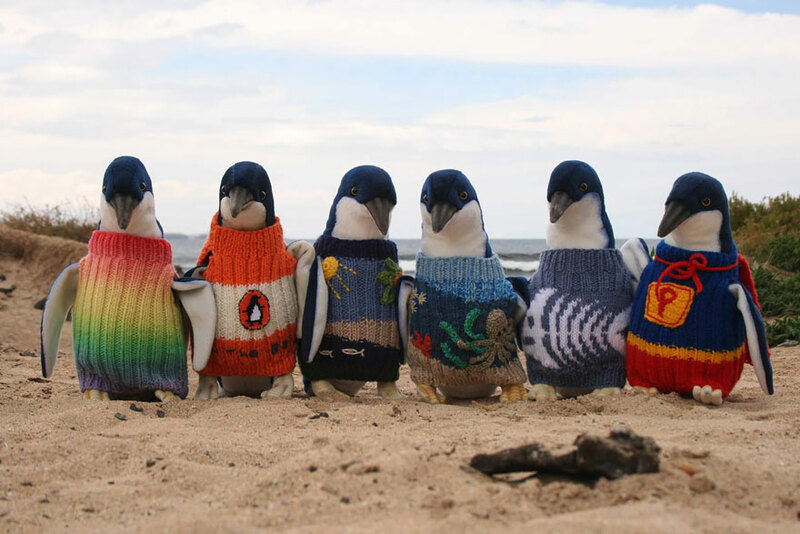 Knitted penguin jumpers play an important role in saving little penguins affected by oil pollution. Father to 7, grandparent to 20, he’s not only been an active knitter, but also a sportsman, having played golf till his 90’s. His secret for longevity? “Waking up every morning”. See, he’s a joker, too! Text copied from boredpanda.com -- scroll down, the story is still very near the top of the list. I couldn't get the link to work, but I googled it and read the story. Amazing. Love the humor in the designs. Imagine having the dexterity and the mental focus to knit at that age. And how did they get those penguins to line up so nicely? Oh I love this! It won't take me to the link but I will try to look it up. I love the sweater with the PENGUIN book logo, so perfect!! The sweaters are darling. The penguins willing to wear them, priceless. I added another link and posted the test and a picture of the 109 year old knitting gentleman. Everyone should read this inspiring story. Posted the text, not test. I loved the Penguin Book Logo sweater too, Kay G.
In Scandinavia it used to be a tradition that everyone knitted, men, women kids. That's how they spent their time during their long dark cold winters plus they all needed the warm clothes their efforts provided. This was such a charming story. You can bet he doesn't have memory problems, seems to me that knitting would be very good for the little gray cells.